Kayla and Melanie love to work together on projects. They are very much alike and sometimes they dress the same way. At recess, they sit together on the jungle gym. They don’t want anyone else to join them. Anna and Julisa also like to be partners at school. They both wear glasses and sometimes they laugh so hard that their glasses fall off. At recess, Anna and Julisa sit together. They are friendly and would be happy to have any of their classmates join them. In class, Kayla and Melanie sometimes make fun of the other children and, one day, they make fun of Julisa and her glasses. When Anna is unexpectedly partnered with Melanie for a science project, she is able to share her knowledge. Like magic, Anna is invited to sit with Kayla and Melanie at recess. Anna’s two new companions laugh at Julisa and continue to exclude her. Fortunately, Anna pauses to consider her relationship with Julisa and before long she realizes where true friendship and her loyalty lies. Two of a Kind is a thought-provoking depiction of how easily children can be lured by the desire to be popular and how difficult it is to be outcast. Sure to prompt discussions about friendship, loyalty and standing up for what is right, it is best suited to readers aged five and up. Readers will be interested to know that Matt Phelan also illustrated Susan Patron’s The Higher Power of Lucky and Betty G. Birney’s The Seven Wonders of Sassafras Springs – two of my favourite novels for middle grade readers. When a young lad moves houses with his family, he is anxious to find a baseball game in his new neighbourhood. He unpacks his baseball glove, bat and spikes and ventures out into the neighbourhood. Once he arrives at the park, he hesitates, watching some children from afar. Rather than joining the kids’ game, he is dejected. He slowly approaches a park bench and sits down. Four aging men are already seated, feeding the pigeons. 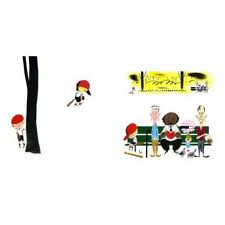 The following day, the disappointed boy stores his baseball gear away and joins the men sitting on the bench. He helps to feed the pigeons. The men take note of his appearance when he joins them on the bench a third time. He looks old – probably much older than they feel! It is time for action. The men give up sitting on the park bench, instead playing on the playground monkey bars and the slide. They are smiling and laughing. They have been transformed. When a bike awaits the boy the following day, it is clear the men think it is time to get moving – they climb onto bikes, a scooter and a wagon, annoying the pigeons and our boy. He just wants to sit. Confidence regained, the youngster approaches the boys and girls playing at the park and joins their baseball game. The cronies cheer from the stands. There is much to love about The Boys . Boldly illustrated, the almost wordless picturebook introduces themes of social isolation, self confidence, ageism and the value of play. Readers will find it both thought-provoking and reassuring. Suitable for children kindergarten age and older. When a six year old boy, his grandmother and her new husband go on vacation to a theme park, all is well until Hortense arrives. Hortense is Bob’s granddaughter and she is suddenly a threat. Nana shares her hotel room with Hortense, she sings “Lavender’s Blue” to her and she sits next to her for all the scary rides. To add insult to injury, Hortense even devises a special name for Nana! Nana’s grandson is despondent. He can’t believe that Hortense has taken his special place with his grandmother. It is not until Nana and Gramps take a ride in the Tunnel of Love that the two children are able to gain perspective and learn to like each other. 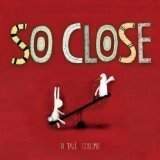 With a message that will resonate with adults as well as children, So Close reminds us that the possibility of meeting a new friend is often not far away. Mr. Duck and Mr. Rabbit rush past each other every day, not realizing what they are missing in their haste. Beautifully illustrated with painterly artwork, So Close offers a gentle message that a smile and a friendly, “Hello” can make a world of difference. I use this title at the beginning of my Celebrating Diversity workshops. I think we have all had the experience of missing an opportunity for a friendship or discovering a friendship under surprising circumstances. So Close is well-suited to classroom use. It could be used to encourage discussion of friendship, loneliness, social situations, hurrying and over-scheduling. Well suited to children 4 years and up. Also available in a Spanish edition. It’s safe to say that reading a book that you can relate to provides a more enjoyable read. Add humour, sibling rivalry, sibling loyalty, and a little competition just makes it better. In The Lemonade War, Jacqueline Davies has created a book that not only encompasses all of these elements, but speaks to a variety of age groups. While her story details the ‘battle of the stands’ between brother and sister, Davies weaves in the topics of friendship, determination, ambition, and forgiveness. 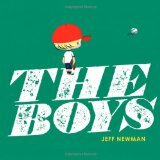 She does so through realistic characters, funny dialogue, and a number of interesting situations that the kids find themselves in as a result of their war. Evan Treski loves and even likes his little sister…most of the time. Jessie Treski idolizes her big brother. While she is smart enough to skip a grade and go into grade four, the same grade her brother is going into, she knows that she’s not the best ‘people person’. That’s Evan’s gift; hers is math. When the two find out they will not only be in the same grade, but the same class, Jessie thinks this will just make things easier for them. She’ll help Evan with math and he’ll help her with friends. Evan feels differently. He’s mortified. How can he possibly go into the same class with his baby sister? How can he keep his friends if they find out how dumb he is compared to her? Rather than telling each other how they feel, they embark, in typical sibling fashion, on an entrepreneurial war. They will see what matters more; people skills and flexibility or strategic plans and organization. One of them will win The Lemonade War, but both of them are willing to do almost anything to come out ahead. As a teacher, I thought this was a fun, light, close-to-summer read. Though it’s not new, I hadn’t heard of it and I didn’t expect to enjoy it nearly as much as I did. Once I read it to my grade five class, who enjoyed and connected with the sibling rivalry, I brought it home to read to my 8 year old daughter. Re-reading it, this time as a mom, I was able to connect to it on a new level. My 8 year old reminds me of Jessie with her thorough plans and detailed organization. My 5 year old daughter reminds me of Evan, with his charm and easy social skills. It was easy to imagine the two of them participating in a Lemonade War of their own. Jacqueline Davies realistically portrays the feelings of her main characters, making you connect with both Evan and Jessie. That connection has you turning the pages, unsure of who you want to come out the winner! The Lemonade War website includes teachers’ guides, lesson plans, a wordsearch and more. Noni is a capable, confident young girl most of the time. She knows the alphabet forwards and back, she helps with her baby brother and she is fine when she walks to her friend’s house. 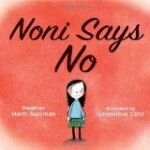 Noni Says No is a thoughtful examination of friendship and how, in some cases, one child’s desire to please another can come at too great a cost. Noni manages well in most situations but, for some reason, she has great difficulty saying “no” to Susie. Readers will infer that Noni is afraid to say “no” because to do so might jeopardize the friendship. When Susie’s demands finally push Noni too far, Noni arms herself for an anticipated battle and manages to find her voice. Genevieve Cote’s powerful illustrations depict Noni’s emotions beautifully. Without a doubt, Noni Says No readers will feel compelled to consider what it means to be a friend and how to assert one’s ideas and opinions respectfully in a friendship. The story will be enjoyed by all children four and up and will have a special resonance for those who lack confidence in social situations. When their teacher announces that the class will be performing The Frog Prince and Marty will be cast as the princess, our young heroine is reluctant to take the stage. Portraying a princess is not for her! Marty McGuire accurately depicts the social challenges experienced by a group of grade three girls as they adapt to change. As well, Marty and her friends manage to find middle ground in this fun, generously illustrated chapter book. Will be enjoyed by boys and girls, grade two and up. Lily Jean’s smug appearance and Carly’s bitter disappointment are depicted beautifully by Ms. Denton. Readers will cheer for Carly when Sandy decides she would prefer to play with her younger sister than with an overbearing bully. You’re Mean Lily Jean is best suited to children four and up. It offers many opportunities for children to consider each girl’s perspective and ways to resolve difficult social situations.